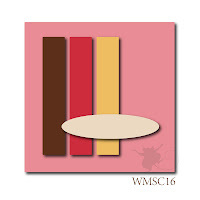 A Special Birthday Card & a Free WMS Digi Image on World Card Making Day! 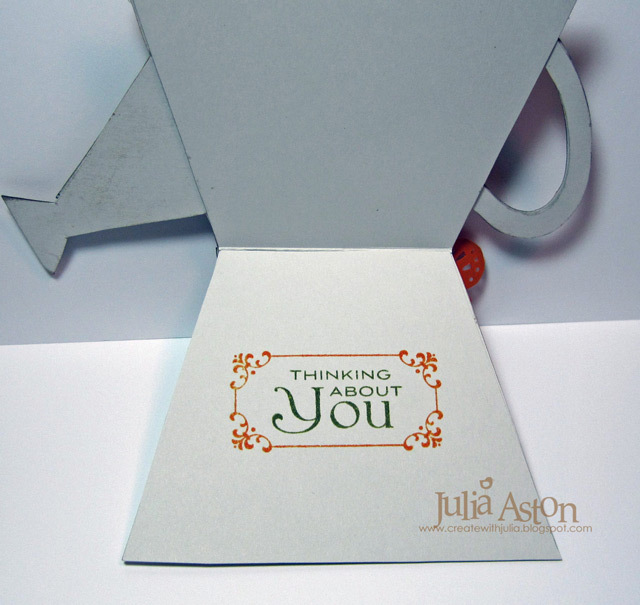 Today I'm sharing a card I made for the Teapot Tuesday Challenge over on Split Coast several weeks ago. 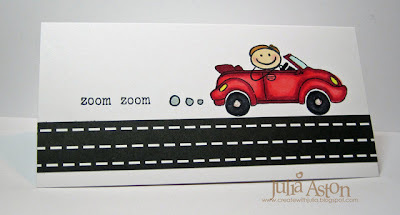 Each week Cindy offers a destination for our cards should we choose to participate. Someone who needs a lift or in this case has a really special birthday coming up. This particular week we made cards for Eula who celebrated her 108th birthday on 9/14/10! 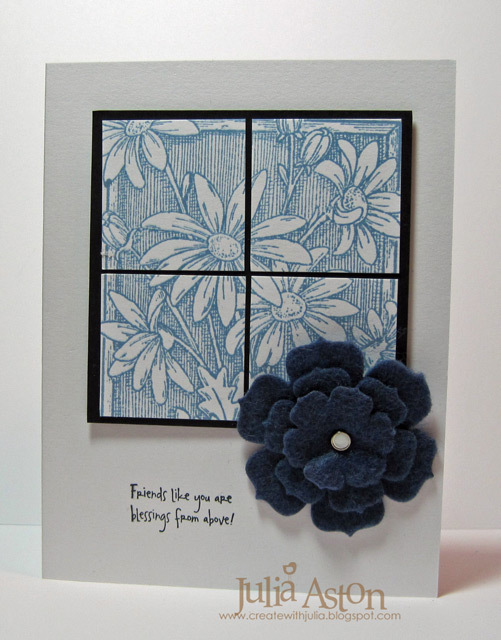 She is known for her flower gardens so I made flowers the theme of my card. The dress by Lockhart Stamps has roses and daisies on it. 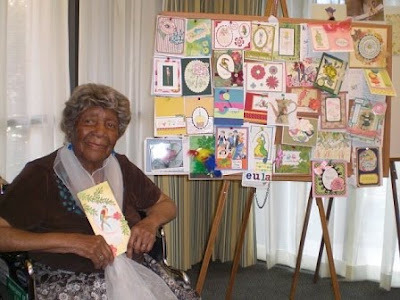 After her birthday - the stamper who let Cindy (Mothermark) know about Eula, sent Cindy this picture of Eula along with just some of the cards she received. (can you see mine on the top center of the bulletin board!?) This lady reads 2 books a month, knits afghans for patients, and takes classes at the assisted living place where she lives. She knows how important it is to exercise your mind! She was just thrilled with all of her cards - and was most interested in learning about blogs and blogging! 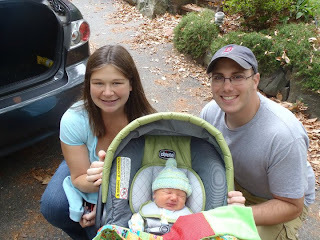 What a wonderful reason to make a card - days like these make me proud to be a card stamper!! Fun alert! : most of you probably know that this Saturday is World Card Making Day - To celebrate - Claire over at Waltzingmouse will be offering a free digi image on that day and will be holding a competition to win a free stamp set of choice. 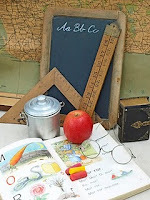 You'll find all the details on the Waltzingmouse Blog on Saturday! And, of course, we're still having the WMS Saturday Sketch challenge as well! Lot's of excitement going on! See you then!! My card today was inspired by the Split Coast Featured Stamper, Sallie's (hobbydujour), fall foliage card . I remember seeing it during the inspiration challenge that she created it for and loving the look of it. I used different stamps and colors, and used a textured Bazzill CS rather than scoring the border. I also added wrinkled ribbon instead of rhinestones. First I inked the stamps with Versamark, then the color (Old Paper & Memento Tuxedo Black) then I clear embossed them and finally sponged over them. I really like how this came out and I'll be trying this technique again for sure! Thanks so much for stopping by today! 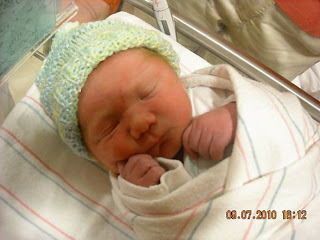 Today is my son's 33rd birthday - boy am I getting old!... either that or he's just catching up to me!! LOL! Wow - It's Saturday again dear friends - did this week go by fast for you?!? And lookie here's the great sketch Claire has for us today! Instead of making 3 panels - I stamped one plaid panel using a stamp from Off Beat Backgrounds. My sentiment is from Peace and Plenty and I cut it using Labels Nine Nestabilities. The leaf is from Blessed by You. 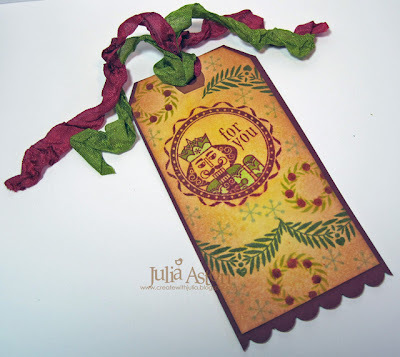 I stamped it in Rusty Hinge, cut it out and added Orange Peel Stickles to make it sparkle! The sentiment and leaf are both up on foam dimensionals. Then I just added some rhinestones to draw your eye around the card! Oh - and I sponged the plaid panel and sentiment with Peeled Paint. So now you need to check out the WMS Sketch Blog and get inspired by the cards the Mischief Makers and other DT members have created this week! 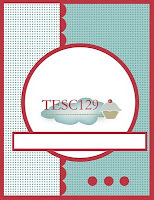 Then make your own card using the sketch and link it on the Sketch Blog by Thursday 9/30/10 at 11:59 pm EST - you could be chosen Top Mouse next week!! Sometimes Claire offers little random winner prizes too - you never know! We've been seeing lots of wonderful sketch cards - hope to see yours there this week - come on - inspire us!!! Did I inspire you today???? 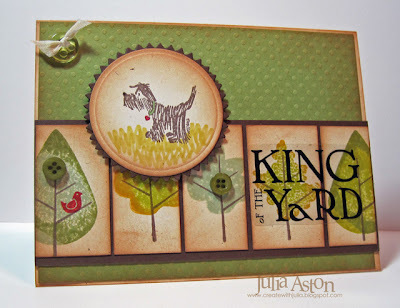 Happy Thursday dear stamping friends - the weekends coming!! 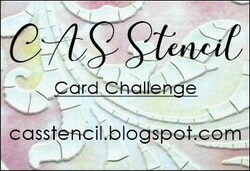 I have three cards from SCS challenges to share with you today. This week's CAS (Clean and Simple) challenge was to use Fall Colors - Kraft, red, vanilla and brown (orange optional). I colored my stamp with Stampin Up markers, stamped it and then sponged a little orange over the forest floor. I used my Nestability circles to cut the image as well as a brown and red framing. I sponged everything with Tea Dye Ink and added a brown button! 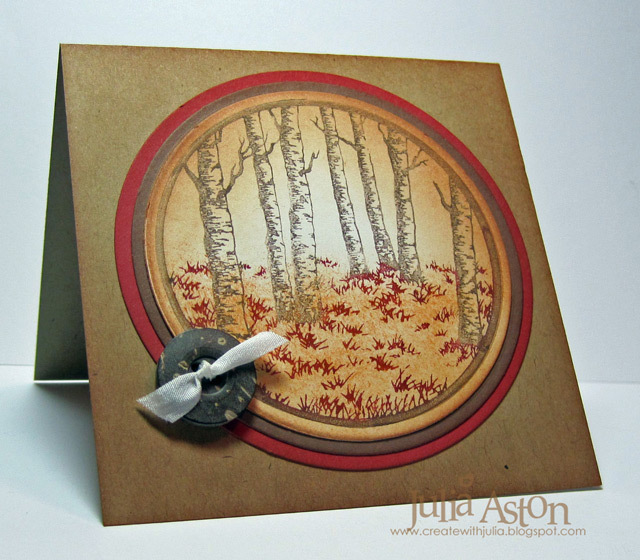 My stamp is Birch Forest from Rubbernecker Stamps the card is 4 1/4" x 4 1/4 ". 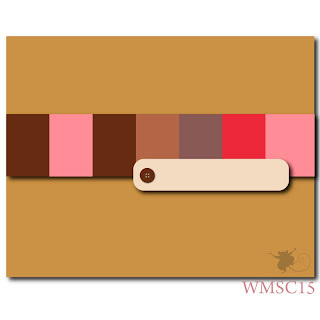 I was honored when Betty asked me to make a card sample for her color challenge on SCS this week. 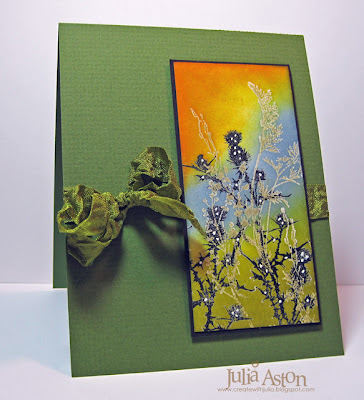 The challenge colors were Cajun Craze, Baja Breeze and Wild Wasabi (SU) I didn't have Cajun Craze so I used Rusty Hinge Ranger Distress Ink for that color. 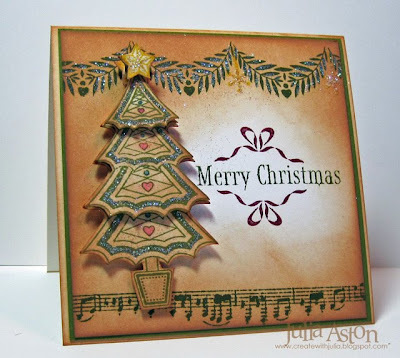 I stamped my trees on white, cut the panel with Labels Nine Nestabilities, then sponged over the trees with Baja Breeze and Wild Wasabi before taking it out of the die. Betty always includes a dessert option with her challenge - something extra to do on your card if you want to - this week it was to use chicklets (single squares of letters making up a sentiment) or strip sentiments. 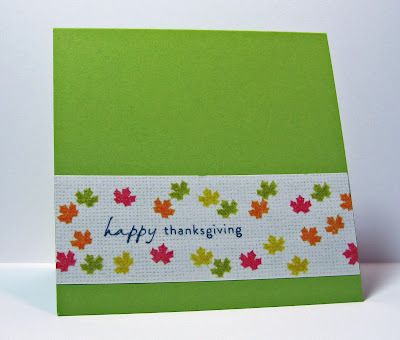 I stamped Happy Thanksgiving, then cut it in half and mounted it separately. As soon as I saw the two kitties on Cindy's inspiration teapot - I thought of this great picture of my own two cats - Scout and Boo (named after characters in To Kill a Mockingbird) Boo is the one in back and Scout is in front (they were actually sitting like this on our diningroom table when I took this pic!!) Don't they look like they have little smiles on their faces?? 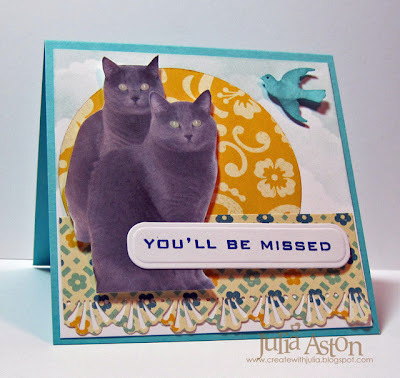 They are letting BertLady's cats know they will be missed! The sentiment is from Free Spirit Sentiments by Waltzingmouse. Accessories: labels trio Spellbinders, Circle Nestabilities, photo, Martha Steward Lacey punch & bird punch, home made cloud template, sponge. Thanks for coming by today! Hope to see you back here on Saturday for this week's Waltzingmouse Sketch - AND I hope you'll play along this week! I remembered that I had a bag of chipboard letters in black and white in my 'chipboard' drawer and so I looked to see what words I might be able to make out of what I had. 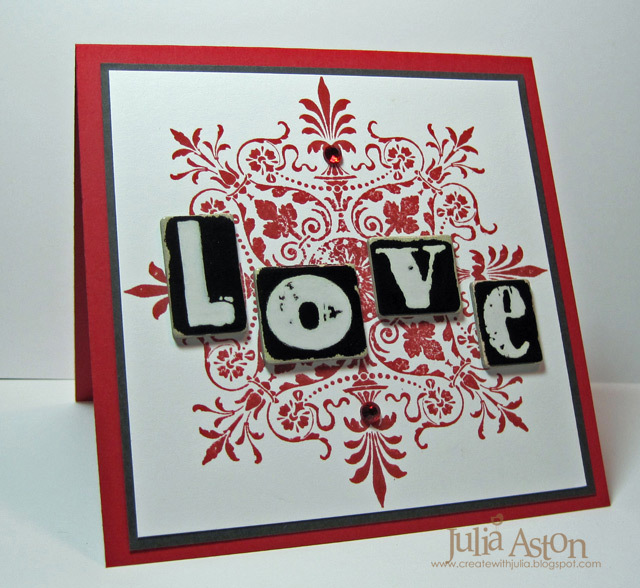 I wanted to use my brandy new Bold Ornament stamp from Rubbernecker and thought LOVE might be a good word to pair with it. I just added a couple of rhinestones to the ornament to soften the bold clunky letters a bit! My card is 5" x 5" square. I think it came out kind of cool! Thanks so much for stopping by today! I always appreciate when you leave me a comment! Happy Saturday my dear stamping friends! Oh - look .... here's this week's Waltzingmouse Sketch Challenge! Isn't it a beauty! For my sketch card today I used one of Claire's own Digital Designer Papers called Celtic Squares. 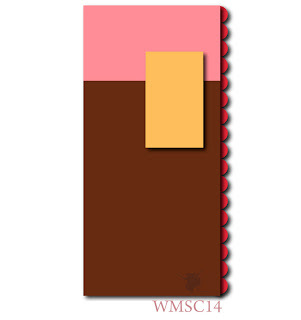 I cut rectangles out of 5 of the colors (there are 8 colors in each design!) Don't these look pretty all lined up! 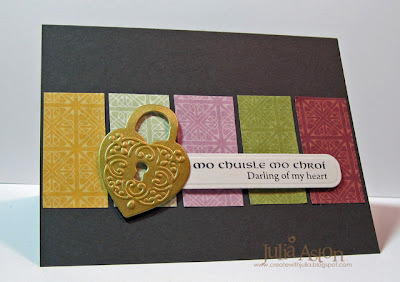 I cut my sentiment from Irish Blessings with a Spellbinders Labels Trio Die - don't you just love this phrase - "Darling of my heart" wow- it gives me goosebumps! You could give this to your spouse, to your child or to a very close lifelong friend. Boy, this card went together easy and I love how it came out! Isn't it great when a card works out the way you envisioned it? On the inside I used stamps from Sweethearts. Then make your own card using the sketch and link it there by Thursday 9/23/10 at 11:59 pm EST - you could be chosen Top Mouse next week!! We're having a warm weather weekend here in New England - the last remnants of summer - but the nights are getting colder - crisp reminders that fall is on it's way! Stamps: Waltzingmouse - Irish Blessings, Sweethearts. Paper: Soft Stone, Smokey Shadow - PTI, gold CS - unknown, Digital Designer paper - Waltzingmouse/Celtic Squares. Ink: Memento Tuxedo Black, Ranger Distress Milled Lavender. 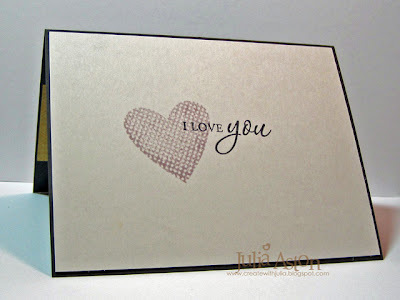 Accessories: Spellbinders - Timeless Heritage (heart), Labels Trio, foam dimensionals. 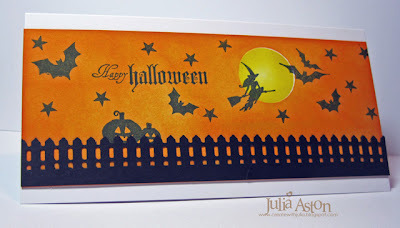 Friends of WMS Blog Waltz - Halloween Theme! 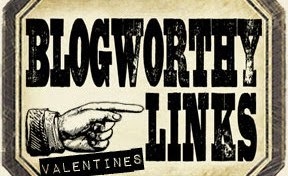 We're having a Friends of Waltzingmouse Blog Waltz over in the WMS forum in the Playroom today. You need to sign into the forum but it's easy to do - so go on over and check it out! The label says - Slyme & Co - Regurgitated Candy - Lightly Salted, Cold Pressed. 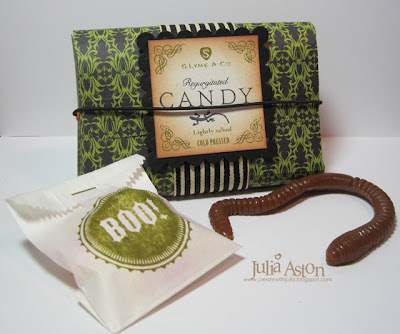 So I felt it was totally appropriate to include this wonderful, so real looking and feeling, gummy worm as a treat inside!! 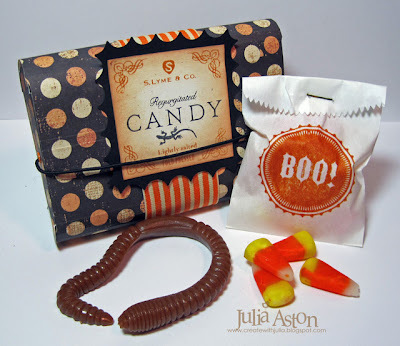 I stamped my little white bag (Michaels) with the Boo stamp and filled it with Candy Corn. Both treats tuck neatly inside my little box. I think I could get one more worm in there if I squished it! LOL!!! 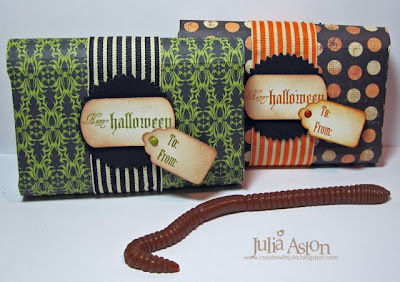 Don't worry - each worm is actually hermetically sealed inside a clear wrapper so you don't have to touch them to get them into the box! Here's a second one done in a different color DP and I used the inverted scallop square Nestability to frame the sentiment - it looks a little more spooky than the regular scallop Nestibility frame I used on the green one don't you think?! The only thing WHITE on my projects is the paper treat bag. And here's how I dressed up the back of the boxes. Oh-oh, I think the gummy worm is on the move! Watch out!!! Remember to look for the word clues on the DT's posts to help you guess the theme of one of the WMS October release sets! 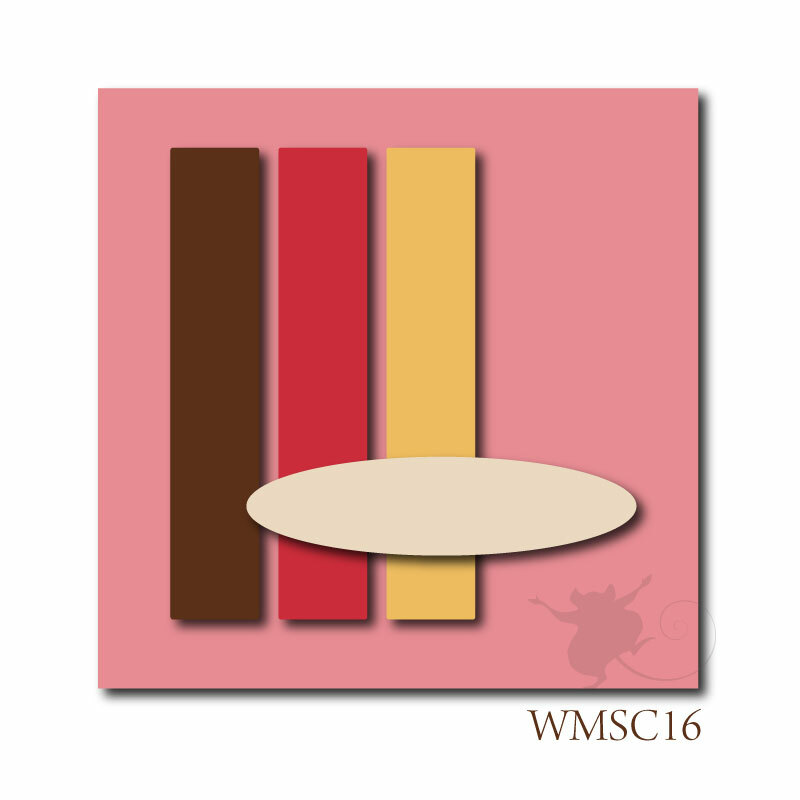 Post your answer over in the Playroom of the WMS Forum for your chance to win a WMS stamp set! Hope to see you tomorrow for the WMS Saturday Sketch challenge??!! Paper: Rustic white - PTI, DP - My Mind's Eye/Night Light Dotted Corn, Green and Black/SU from last year. Accessories: Rubber Band Box Template - WMS, black round elastic cord - Dritz (JoAnn's), orange eyelets, cropadile, white mini bags - DMD Industries/Michaels, Sizzix scalloped label die, key tag punch - SU, Stapler, pinking circles, scalloped and inverted scalloped square nestabilities, wide grosgrain striped ribbon - Sharon's Stamp Simply Ribbon Store. Driving By - with Christmas Greetings! Good morning Stamping Friends! I've got two cards to share that I made for challenges over at Split Coast. I used different stamps, different papers and colors, and made mine a 'hi' card - I stamped the sentiment right on the DP and it's not too visible on this picture - but it is clear IRL! It says "driving by saying hi!" My stamps are from the just released set called Half Pint Heroes by Waltzingmouse. 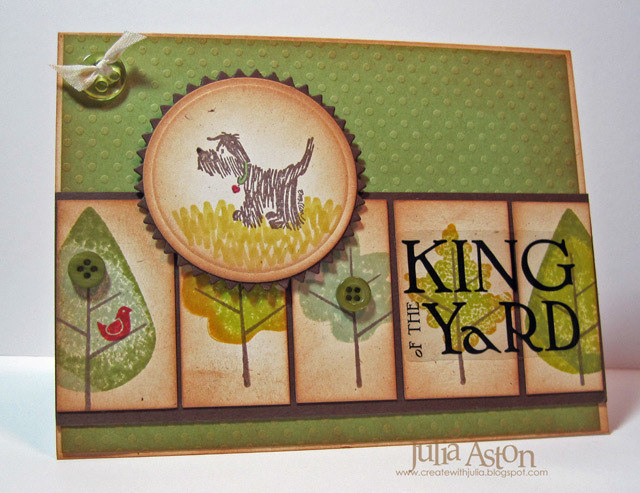 My second card was made for the Featured Stamper challenge. I didn't have to go far to be inspired by Die Cut Diva's gallery. I stopped right at the first card Merry and Bright ! I liked the colors on the kraft card. 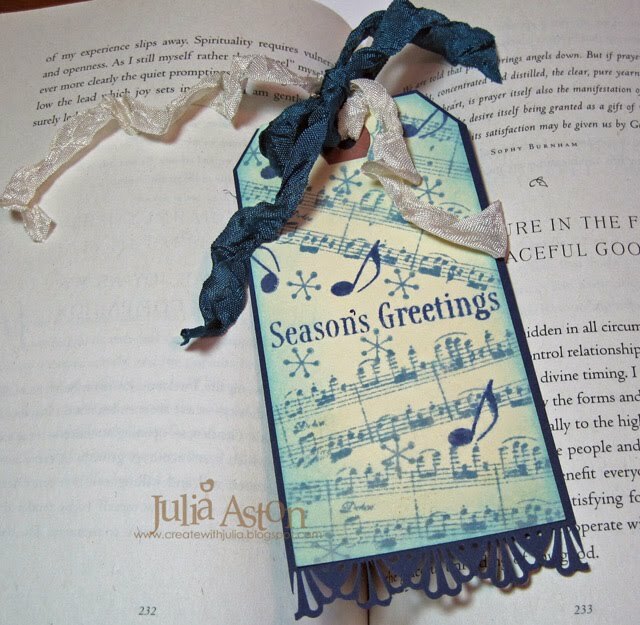 I used different stamps and tied a ribbon instead of putting an image on the corner. 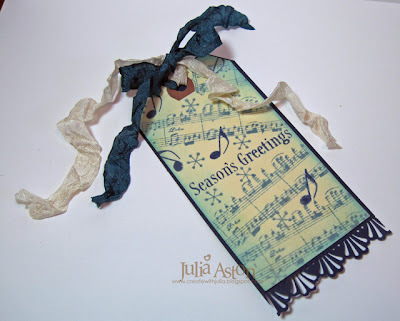 My stamps are from two just released Waltzingmouse stamp sets - Musical Backgrounds and Teeny Trees. I stamped the musical background on a 3"x3" piece of cardstock, cut it into 1 1/2" squares, sponged the edges and spritzed with water, VERY lightly! ETA: Reminders: we're having a Friends of Waltzingmouse Blog Waltz over in the WMS forum tomorrow (9/17)- check it out here! and on Saturday (9/18) is the weekly Waltzingmouse Sketch - check that out here! Happy Wednesday everyone! My cards today were made for the Inspiration Challenge over on Split Coast last Saturday. Of course I had to look at the Halloween section of the Cost Plus World Market web store Stephanie showed us! 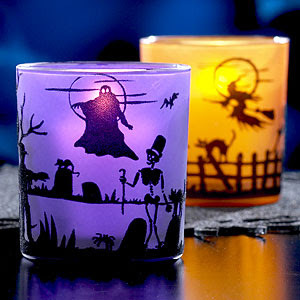 These spooky votive candles caught my eye! So I made two 6"x3" cards - one for each votive! All my stamps are from Waltzingmouse The stamped panels started out white and I sponged them with Ranger Inks - the only addition is the fence punched panel on the orange one. 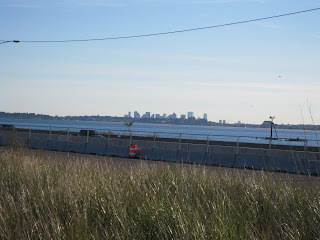 After I made these cards, Kent and I went for a walk over at Lynn Beach. It was a gorgeous sunny but cool day. 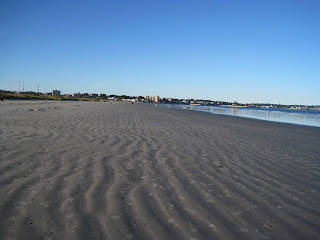 Lynn is a city right next to our town that just happens to be situated on the Atlantic Ocean - so we drive through congested houses, factories and traffic and come to this lovely beach! It's pretty crowded in the heat of the summer but this time of year there are mostly 'walkers'! We parked at one end of the beach and walked down the beach for 25 minutes on this paved sidewalk. 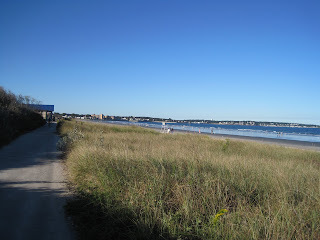 We probably won't have many more of these lovely evenings at the beach - fall's a comin'! 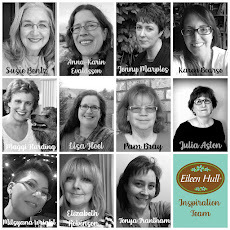 WMS September Release DT Blog Waltz! Yippee! We're finally here! The long anticipated WMS September Release Day! 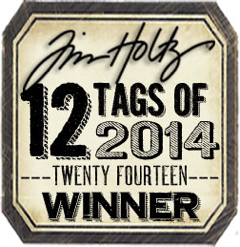 Claire and the Design Team are celebrating with a Blog Waltz. Please start the waltz over on Claire's blog. 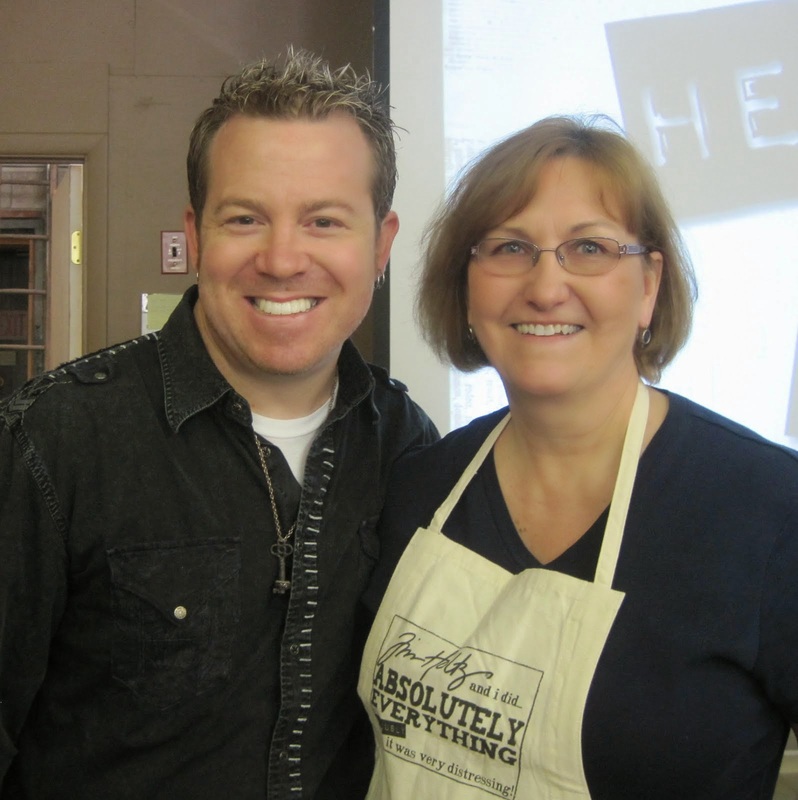 If you came here from Laurie's blog - you are in the right place! For my first card today I used Nutcracker Sweet and Music Backgrounds. I stamped the tree 3 times, colored the circles and hearts with colored pencils and gamsol, then layered pieces over the initial stamping with foam dimensionals. I sponged the card edges and tree with Tea Dye ink then added some Dazzling Diamonds on the tree and the garland for holiday sparkle! For my 2nd card I just had to use Teeny Trees again - this set is just so fun to use!! Today I just stamped the little leaves across a piece of Linen Vellum along with the sentiment and adhered the strip to my card base. Easy peasy and oh, so cute - don't you think??! For my third card (someone stop me please!!!) 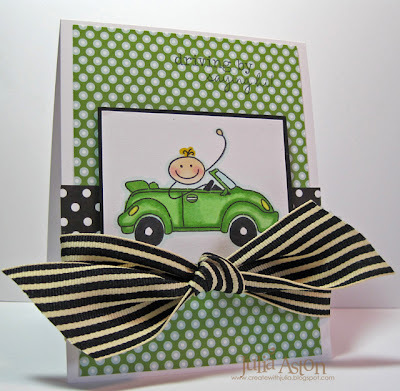 I just had to use this cute little car in the Half Pint Hero's set. 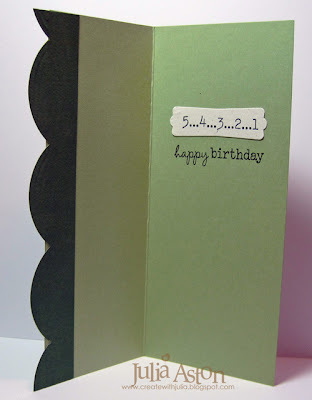 My card is 6" x 3" and very CAS - I stamped right on the cardstock and only added a strip of patterned paper. I used Copics to color my image. And I couldn't end the sneaks without making at least one card using the Bountiful Basket Additions could I??? 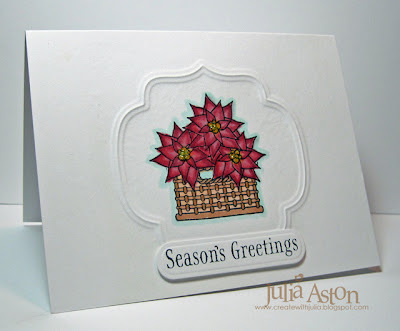 Here's another CAS card - I stamped directly on the cardstock, stamping the flowers, masking them and then stamping the basket. I dry embossed the framing with Labels 9 and colored with my Copics. 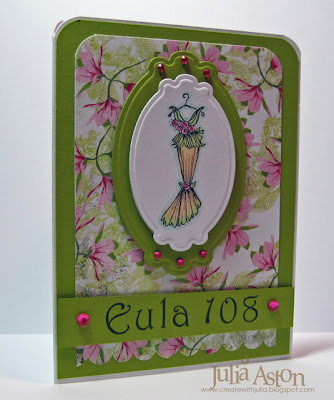 I cut the sentiment with Spellbinders Tag Trio. Then I just added yellow stickles to the centers of my poinsettias. 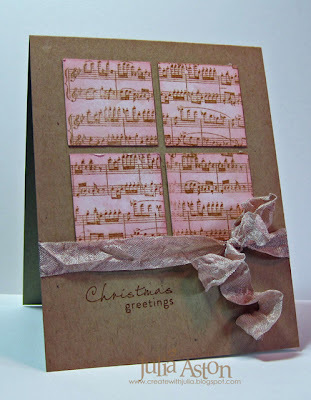 You can see my tutorial on dry embossing a frame on my previous post here As always - you can win a WMS stamp set of your choice during the Waltz just by leaving comments on our blogs - you get one chance by leaving a comment on Claire's blog and another chance by leaving comments on the DT's blogs (a random winner will be chosen from one of the DT's comments!) You must leave your comments by 11:59 pm EST 9/14/10 to be eligible to win. AND don't forget to take your shopping list over to the WMS store and order up these wonderful stamps before they are gone! Accessories: Nestabilities Labels 9, Spellbinders Tag Trio, Eclipse Tape, Foam dimensionals, Copics: BG10, E02, E13, E35, RV11, R35, R59, Y15, Yellow Stickles - Ranger. WMS Sneak Peeks - Day #3 - Have a Blast! Happy Saturday dear friends! You're getting 2 for 1 here today! I'm sneak peeking a new WMS set called Half Pint Hero (that will be released tomorrow!!!) AND I'm using the Saturday WMS Sketch to do it! whoo hoo!! 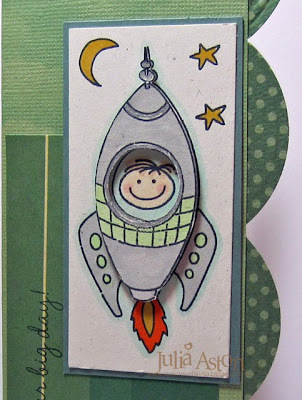 So here's this week's super sketch: And here's my card: Isn't this the greatest little rocket ship?? and look at the little kid's head inside!! I stamped the rocket on the panel - then stamped it again - cut out the body of of the rocket, punched out the window and layered it over the panel with foam dimensionals. I stamped the sentiment "have a blast on your big day!" 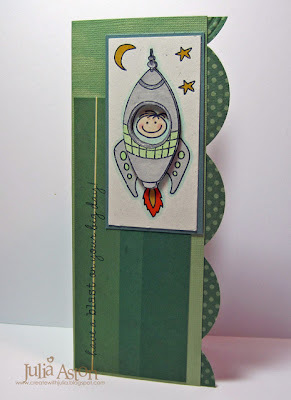 vertically right on the designer paper to enhance that feeling of the rocket taking off - going up, up, up!! Finally on the inside I stamped the count down along with "Happy Birthday!" This great kids set has 3 different 'modes of transportation', about 15 sentiments, several single words, 7 little faces and some other fun stamps. So check out the WMS Sketch Blog and see the great sketch cards the Mischief Makers and other DT members have created this week! Some of them may be using new release sets! Then make up your own card using the sketch and link it there by Thursday 9/16 at 11:59 pm EST - you could be a Top Mouse next week!! And now - off you go to check out Claire and the DT sneak peeks linked below - I can't wait to see what new sets they are working with today! See you tomorrow for the big release! Claire and the DT are having a Blog Waltz and you will have 2 chances to win any WMS set you'd like!!! You won't want to miss it! Today begins the Waltzingmouse Design Team's Sneak peeks of five wonderful new stamp sets Claire is releasing on Sunday 9/12/10. Today I made a fall theme card using one of the tree trunk stamps and one of the round 'leaves' stamps as well as one of the little leaf/petal stamps! I stamped the leaves twice - cut them out and layered them over the initial stamping for some dimension. Then I did a lot of sponging. This textured Coredinations paper is to die for. 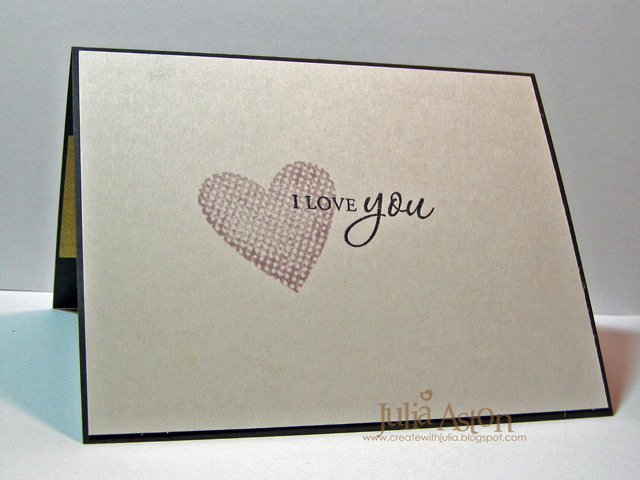 It's like embossing without having to! LOL! So off you go to check out Claire and the rest of the DT linked below - let's see what new sets they are working with today! You're going to love what you see - I guarantee it!!! Hope to see you back here tomorrow for more Waltzingmouse sneak peeks! Accessories: Sponge & applicator Inkssentials Ranger, foam dimensionals, rectangle nestabilities, modern label punch - SU, Vintage Buttons & silk ribbon - PTI, glue dots. Hello stamping friends! The CAS challenge on Split Coast this week was to use this sketch for our card. I used a Bold Floral stamp from Rubbernecker for my image that I cut down to a 3x3 square and cut that into 4 - 1 1/2" squares. Then I mounted it on a 3 1/4 x 3 1/4 piece of black and adhered it to the card using foam dimensionals. I made my felt flower with dies from PTI. Then I just added my sentiment. Clean and simple! 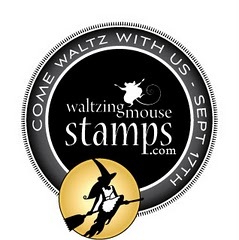 Don't forget to stop by tomorrow for the start of my Waltzingmouse Sneak Peeks!!! You're gonna love 'um!!! Happy Tuesday everyone! I'm on vacation this week - so everyday feels like Saturday to me ......... what a great feeling that is! So Tuesday is also Teapot Tuesday over on Split Coast and this week's 'story' is all about butterflies and a school for butterfly behavior, and we're all going to Coconut Creek FL - the butterfly capital of the world for out teaparty this week - We have to bring beautifully behaved butterflies and beautiful flowers! 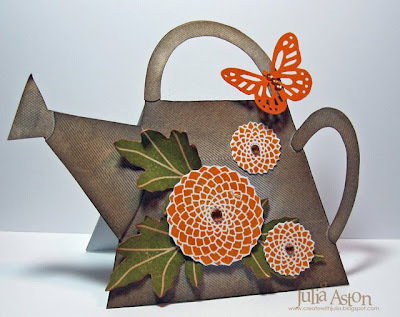 Every week Cindy also has a destination station to go with our teaparty - she finds people who need encouragement or cheering up - and we can send them our teapot cards. So my card will be going postal to fellow stamper Jackie - who was recently diagnosed with cancer. She loves flowers and butterflies - so hopefully this will give her a little bright spot in her day! You can read all about the challenge and the destination challenge here. 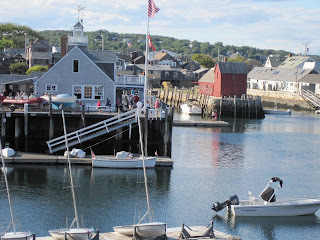 I thought I'd share some pics I took at Gloucester and Rockport, MA when Kent and I went there this past Sunday! It's just about 40 minutes from where we live. 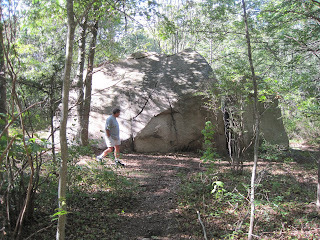 First we drove through Gloucester and took a 30 minute hike through a small part of Dogtown where there are a lot of huge boulders that the glaciers dropped here many moons ago! 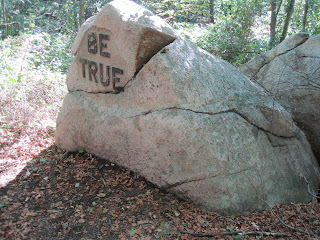 A man named Roger Babson decided to have some of the stones engraved so people walking through the woods would be inspired to live morally! There are a total of 22 engraved stones throughout the reserve - here are just 2 of them. 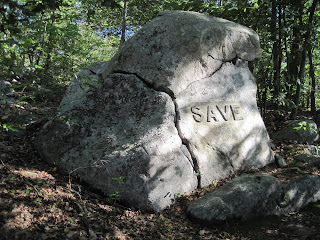 There's quite a strange history to these 5 square miles of woods called Dogtown. You can read about some of it here if you are interested! Kent and I are going to go back to explore some more of it another time! 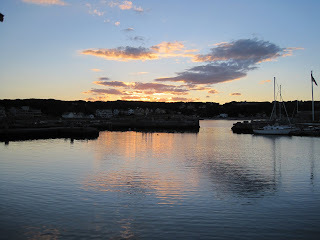 Then we drove down the highway a bit to Rockport, MA. The red building is the famous Motif #1. 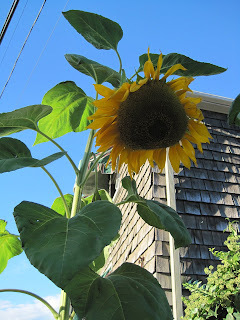 This giant sunflower was growing in someone's front yard along one of the main streets! I was standing up straight taking this picture - so this must be about 8 feet tall! 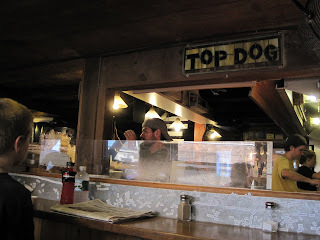 We ate lunch at this fun little hot dog restaurant called Top Dog - it was hardly bigger than what you can see right here - they had a few picnic tables out front and out back and a few bar table areas to sit inside - and no air conditioning! 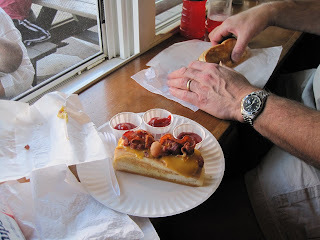 But the dogs were good! And here's the beautiful sunset just as we were leaving. What a perfect day! Just a reminder: My Waltzingmouse Sneak Peeks start Thursday!! Hope you'll be able to stop by! 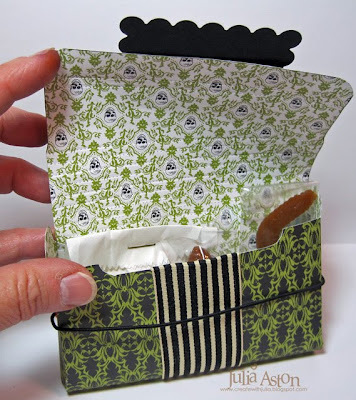 Accessories: Foam dimensionals, glue dots, rhinestones - Kaiser, Watering can template - WMS freebie, Buterfly punch - Martha Stewart, sponge and applicator Inkssentials Ranger. Is It Tea Time or Halloween?? !